Day Tay’s 3D printer filaments have high purity to prevent clogging of printer nozzle during operation. Plastics have come a long way as one of the most important materials for diverse products, including garden hoses and accessories, since the 1960s, to have replaced its predecessor natural rubber that had been used as early as 1600 BC. With great malleability, structural durability and lightweight, such material has also been widely applied in the form of various filaments in 3D printing. 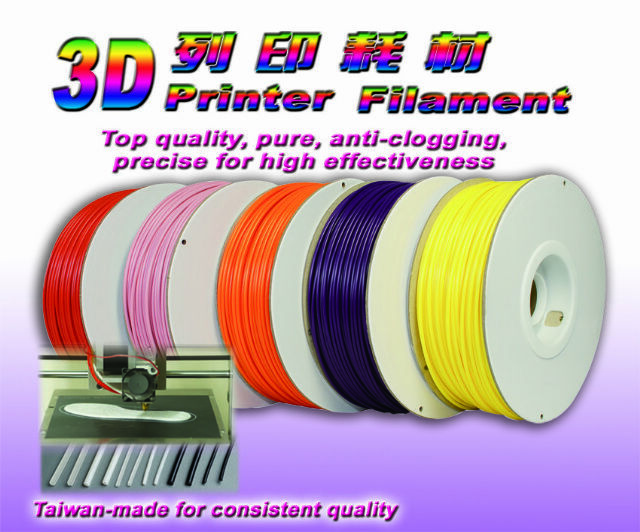 Among Taiwanese suppliers of plastic materials, Day Tay Plastic Industry Ltd. supplies anti-clogging 3D printer filament. The 3D printer filament from Day Tay is made of high-grade plastics coupled with the maker's well-honed manufacturing techniques and rich knowledge of plastic properties, with the whole production strictly controlled according to international standards at the firm's modern factory. The process gives the firm's filament excellent purity and consistent diameter, important characteristics for such products, given that filaments are just like the blood of a printer, which is pulled out of a nozzle by an extruder wheel to the hot end and then molded into various shapes as needed. Without the said characteristics, filaments would easily compromise the functionality and service life of a 3D printer. Day Tay's anti-clogging, high-quality 3D printer filament is available in many colors, and ensures high printing effectiveness and efficiency as an ideal product for end-users from different industries. Founded in 1996, Day Tay Plastic Industry Ltd. is a specialized supplier of various extruded plastic products, mainly tubing products and plastic components and accessories. The 3D printer filaments aside, the company's product lineup also includes braided tubes, air hoses, soaker hoses, fishery hoses, filter tubes for water filters, hold-down strips for printing machines, bag trim tubes, garment tubes, garden hoses, sprinkler conduits, handbag piping, irregularly shaped rigid and flexible tubes and strips, sleeves and sheaths for utensils, etc. Day Tay is noted for its unparalleled know-how of plastic material properties, and capably applies various plastics, including PVC (polyvinyl chloride), PE (polyethylene), ABS (acrylonitrile butadiene styrene), EVA (ethylene vinyl acetate), PS (polystyrene), TPU (thermoplastic polyurethane) and PP (polypropylene), in production to meet customers' demand. Having such capacity enables the company to satisfy customers with all-around services, from plastic sourcing, packing to order budgeting and assessment, material evaluation and mold design. Underpinned by strong commitment to customer satisfaction, precision and efficient manufacturing and high quality, Day Tay has established solid reputations as a reliable, competent subcontractor among customers worldwide. Also, the veteran maker fills contract orders on OEM (original equipment manufacturing) and ODM (original design manufacturing) basis.